Choose the camp that suits you best! Who can participate? We need 4 volunteers, older than 20 years old, who can speak Spanish and with experience in working with children at risk of social exclusion. Where will it take place? Cartagena (Murcia). The Cartagena Urban Camp will be held from the 1st to 7th August, 2019. The timetable will be from 9:30 a.m. to 8:30 p.m.
We have designed some activities, workshops, and free time games. The volunteers must develop those activities participating actively and accompany children. The volunteers will be accommodated in the salesian community of Cartagena. Who can participate? We need 2 volunteers, preferably with knowledge in Spanish. They must be willing to work and transmit the Salesian values. Where will it take place? Beniganim, Valencia. Our camp is targeted for children between 8 and 19 years old. The camp will be held in a house that has the necessary facilities to spend ten days of camp: swimming pool, bedrooms, playground, forest, kitchen and dining room. The activities we do are typical of our style: prayers of good morning and good night, group formative moments, bathing, games, workshops, cleaning of spaces, some outing or excursion, Eucharist, etc. It would be better if the volunteers required speak some Spanish, in order to facilitate the work with children. In any case, we have volunteers who speak English and French. ​If you are interested or need more information, please feel free to contact Beatriz Cortés at internacional@confedonbosco.org, sending your CV and motivation letter. (English and Spanish preferably). 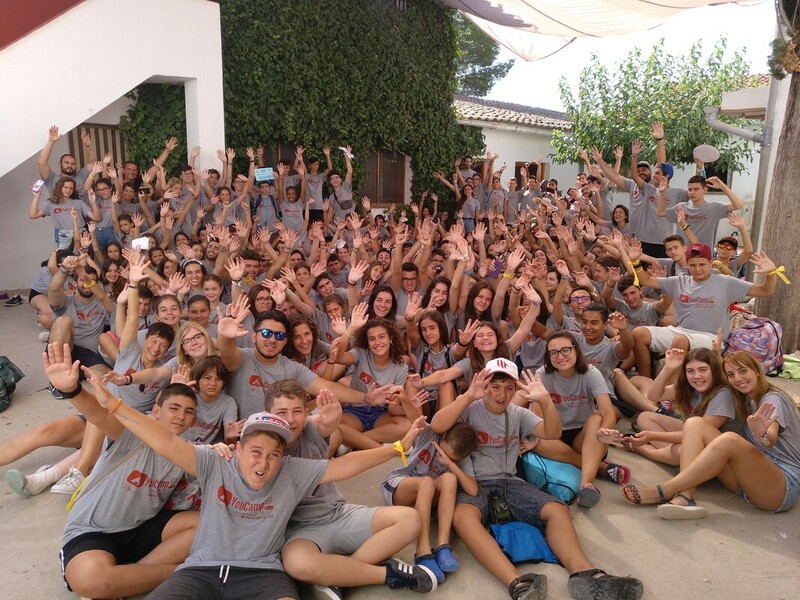 ​Youth Assosiation Barasona organizes a summer camp in La Pueblo de Castro (Huesca), the dates are not determined yet, but probably from 8th to 25th (2 shifts). Who can participate? We need 2 volunteers older than 18 years old, with experience in working with children. It would be preferable that volunteers could speak some Spanish for having good communication with ​ other volunteers and children at camp. What date will it take place the summer camp? The dates are not determined yet, but probable dates are from 8th to 25th July, 2019. Barasona is a very special place, where children will enjoy the nature with their friends. More than 60 children from 7 to 12 years old will participate in each shift. The animators team of the camp will develop activities for a group of children of different ages. In addition, the animators will accompany the volunteers in the proposed activities (crafts, parties and evenings, musical activities, gymkhanas, water sports activities, excursions, great games and moments of team work). The volunteers will be responsible to develop some activities supported by the team. ​We will encourage volunteers to prepare some typical activity of their countries, (gastronomic night, popular song and typical dances, children's game, craft ...) then all the children and the rest of animators can get to know the volunteers better. The camp will be held in La Pueblo de Castro (Huesca) which is a natural and rural environment. Therefore, the communications are limited. We will sleep in a shelter and we will offer various cultural activities. We have two vacancies, and we encourage volunteers to be with us both shifts, so they will enjoy the experience the maximum. We require two animators over 18 years old, they must have experience with children and the desire to share experiences knowing a different reality. Who can participate? We need two volunteers (18-26 years old) who are able to speak and understand some Spanish and have experience in working with children aged 9-18 years old. From the Where will it take place? Quintanar (Burgos). Despite the fact that the Camp will take place from July 16th to 30th in Quintanar (Burgos) . We require the volunteers to be in Valencia on the 14th July in the afternoon to join the last pre-camp meeting. We work divided into groups of ages. Every group develop different activities and dynamics. There are also certain activities we do all together. Some of the activities we develop are: Good Mornings, Good night, training moments, games, etc. The volunteers will be accompanied at all times with a group of monitors. If you are interested or need more information, please feel free to contact Beatriz Cortés at internacional@confedonbosco.org, sending your CV and motivation letter. (English and Spanish preferably). Youth association Tucumán organizes a summer camp in el “El Teularet Navalón” (Valencia) from the 30th of July to the 9th August. Who can participate? We need one volunteer, from 20 to 25 years old. He/She must have at least two years of experience in working with children as Leisure Time Monitor. The volunteer should speak some Spanish. Where will it take place? “El Teularet Navalón” (Valencia). This Volunteering will consist of a 10-day camp. In this camp will participate about 220 children (8 to 18 years old). The activities we will develop are very varied and adapted to different ages (gymkhanas, swimming pool, outdoor games, etc). We will plan moments of reflection in groups. We will also do activities with the whole group together. One day we will make a march on the mountain, another day we will go to swim on the river, etc. ​The camp takes place in the facilities of "El Teularet" (Navalón) in the Sierra of Enguera. We are a team of 45 monitors, we normally set a topic for every day for instance Harry Potter, but we have not decided the topics of this year yet. The camp will start the 31st of July, but we require that the volunteer come to Alicante the 30th and we will go there one day before by bus with the rest of the monitors. ​Youth association Trobada d’Amics organizes a summer camp in Villanúa (The Pyrenees) from the 16th to 28th July. Who can participate? We need two animators from 20 years with some work experience with young people of any age. What date will it take place the summer camp? The camp is from July 16th to 28th. Where will it take place? Villanúa (The Pyrenees). ​It is an environment of wide reception, with young people between 8 to 18 years old willing to spend a few days in a different place, away from the city and new technologies. We will sleep in camping tents. Choose your option and see you son! Summer Fun Camp, at A CORUÑA. Asociación Juvenil Barasona, at La Puebla de Castro (HUESCA) . Centro Juvenil Áncora , at Benigànim (VALENCIA). Centro Juvenil Amics, at Alto del León (SEGOVIA).